September 11, 2016 – This shot from the NASA/ESA Hubble Space Telescope shows a maelstrom of glowing gas and dark dust within one of the Milky Way’s satellite galaxies, the Large Magellanic Cloud (LMC). N159 is located over 160,000 light-years away. It resides just south of the Tarantula Nebula (heic1402), another massive star-forming complex within the LMC. 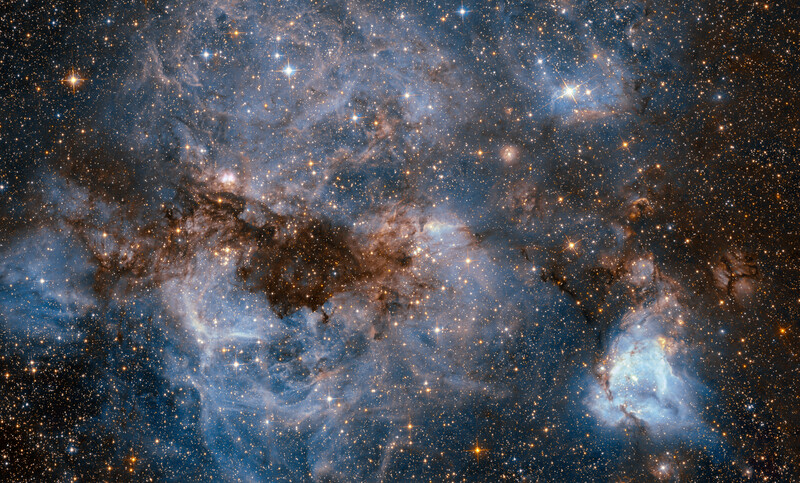 This image comes from Hubble’s Advanced Camera for Surveys (ACS). The region was previously imaged by Hubble’s Wide Field Planetary Camera 2, which also resolved the Papillon Nebula for the first time. The ACS, installed during Servicing Mission 3 in 2002 doubled Hubble’s field of view with sharper image quality and more sensitive detectors. ACS was built by Ball Aerospace in Boulder, Colorado. Lockheed Martin Space Systems was responsible for building Hubble’s cylindrical casing and the Support Systems Module, and for integrating the telescope. NASA recently awarded a contract extension to Lockheed Martin Space Systems Corporation to continue maintaining the health and safety of the Hubble Space Telescope.